As a European I think that we totally fail in Digitalisation and successful startups. The reason is probable the smaller founding which are harder to get. If we compare with the US and China, which are countries and not a continent we still fail. So let’s have a look on the population. We can see that China is the biggest with 1386 Million people followed by Europe with 741 millions and the US with 327 millions. Most of the populations in Europe lives in in regions with good (and mostly free) education. My expectation was that the population correlates with the number of unicorns. Even the USA scores the worst on the PISA study they dominate the startup business. They make the beste our of their best and innovative people. 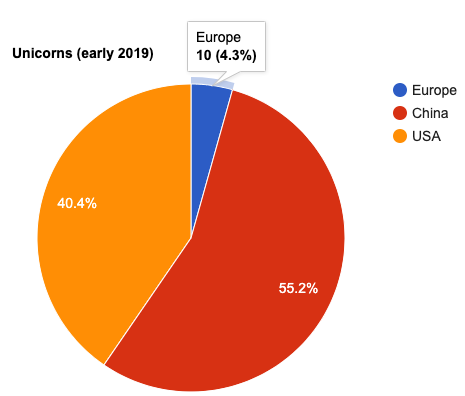 China share on unicorns is clearly the larges but and it’s really close the the share of the world population. 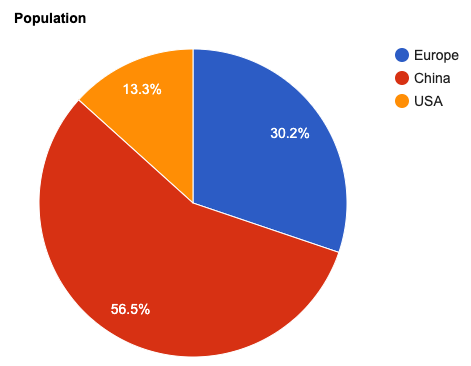 The clear loser in this statistic is Europe with only 4.3 %. Another big problem is that US Startups quickly enter the European market while this rarely happens the other way around. If we have a look of big Internet companies like Amazon, Facebook, Google and eBay, Europa has nothing in this order of magnitude. China does not have this problem (which might be related to the strict market regulations). Here we have (and that are only the companies I know about without researching) Alibaba, WeChat and Baidu.